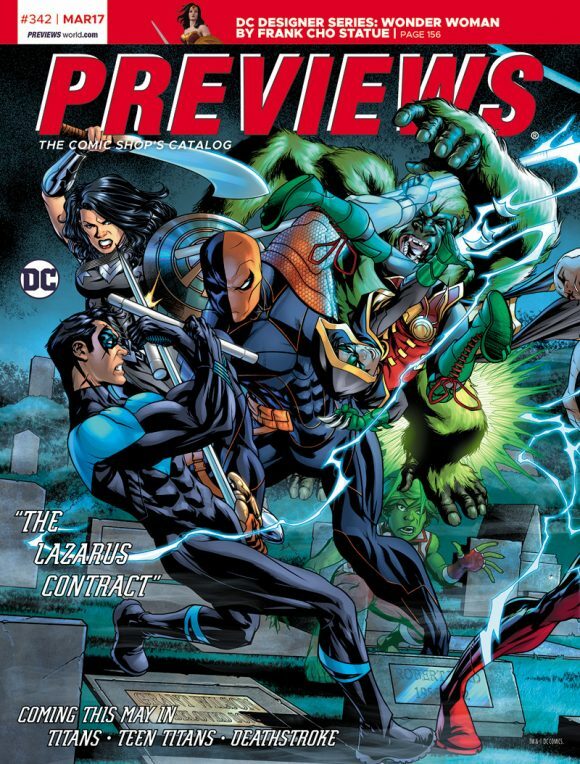 The Diamond Previews catalog is an impressive book. Every month it comes out and has tons and tons of products in it. Some of it holds no interest for me, but for the most part, I think it’s an amazing thing. There are gems throughout and you can even overlook some things because of awesomeness overload. 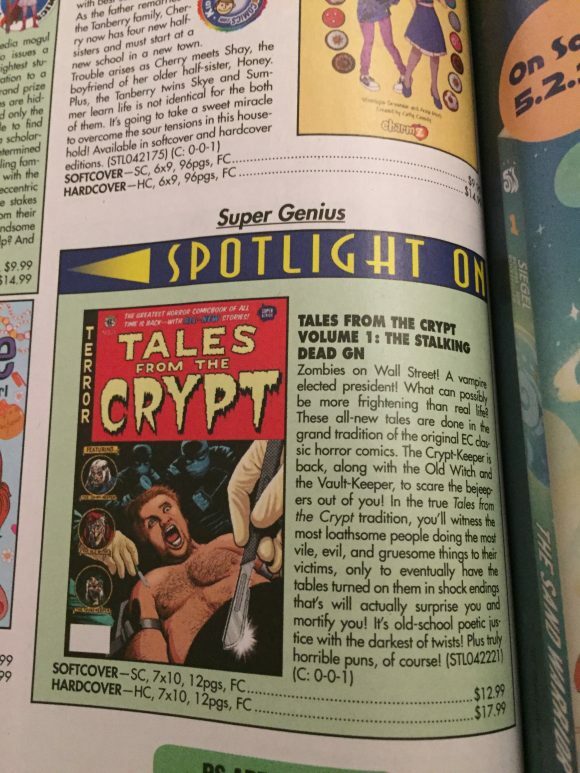 If you’ve never looked through the catalog, the next time you stop in to your local comic shop, ask them for a copy. We have several copies around our shop so people can peruse at their leisure. (And you can buy one for 4 bucks.) It can be intimidating at first, but stick with it because the layout will quickly become familiar and you will have learned so much. To help, once a month I’ll post the 13 things I am most excited for in the latest catalog. So here goes, in no particular order! 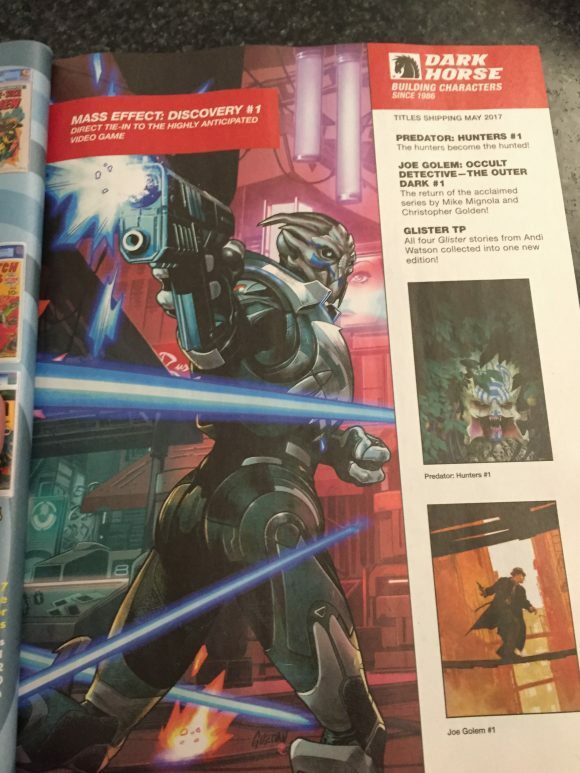 Mass Effect: Discovery #1. This book is still a few months out but I can’t wait. Mass Effect 2 is my favorite video game ever (and Garrus is my boyfriend, so back off ladies and gents!) and my kids and I are so looking forward to Andromeda. This looks to be a great series from Dark Horse! 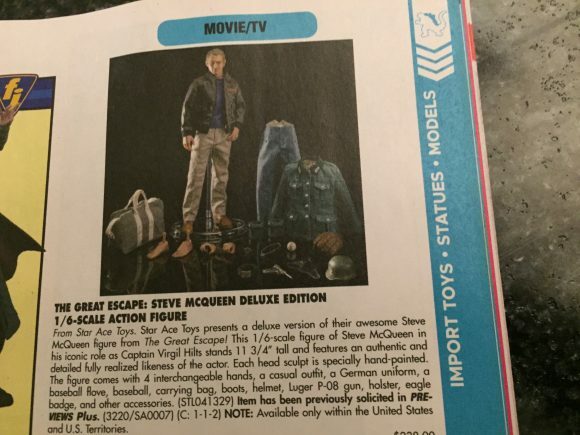 The Great Escape: Steve McQueen Deluxe Edition 1/6-Scale action figure. One of my favorite movies of all time and one of my favorite actors. (And remember, he was in Bullitt with Robert Vaughn!) And this figure from Star Ace Toys comes with a baseball and glove! How cool is that!?! If you don’t understand why that is super cool, go watch The Great Escape now. You can come back to reading this! 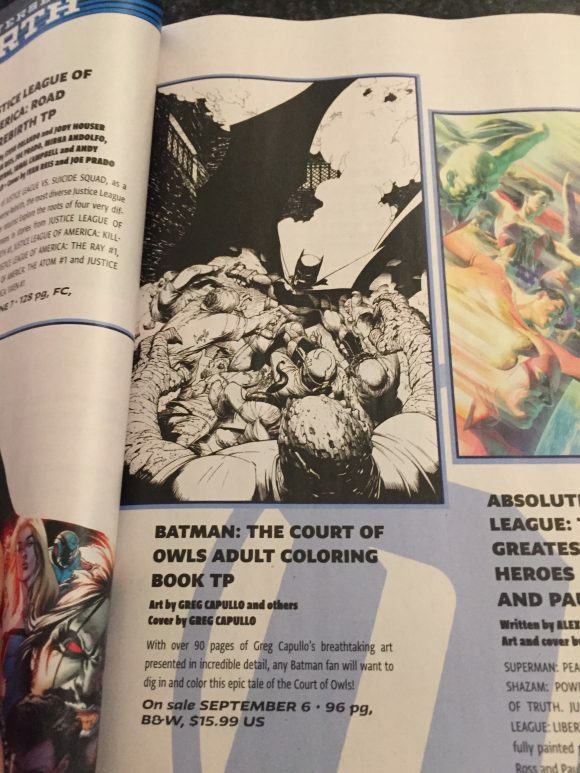 Batman: The Court of the Owls Adult Coloring Book. I love “adult” coloring books and I also love Greg Capullo’s art from the previous Batman run so this is right up my alley! I always wonder what colorists think of comic coloring books? Jordie? Laura? Matt? Thoughts? Tales From the Crypt Vol. 1: The Stalking Dead. I am slightly biased here because yours truly may have a story or two in this volume from Super Genius/Papercutz. However, I am a huge fan of Tales From the Crypt, the Crypt-Keeper, the Old Witch and the Vault-Keeper, so this is a must for me regardless! 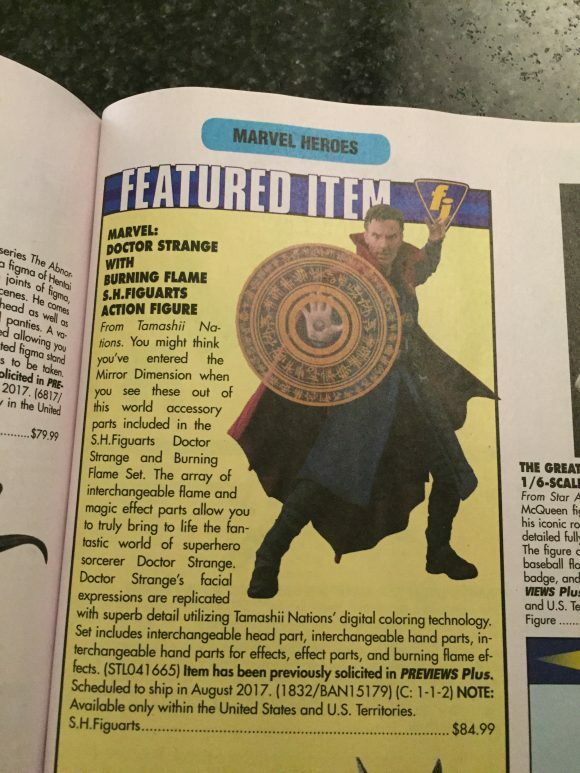 Marvel: Doctor Strange with Burning Flame S.H.Figuarts action figure. I’m a big fan of Doctor Strange, not just of the movie, and this figure looks amazing! It’s a little pricey, but come on! It’s Doctor Strange! 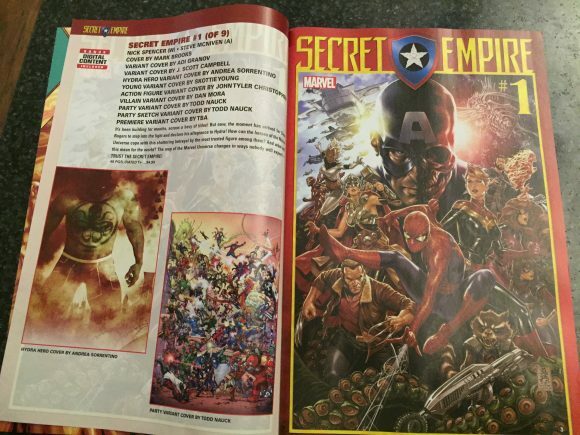 Secret Empire #1. Big changes are coming to the Marvel Universe thanks to stupid Hydra messing with Steve Rogers. Everything has been building up to this point and I am excited to see where it’s going to end up. Oh, and I’m still #TeamCap. All the way. 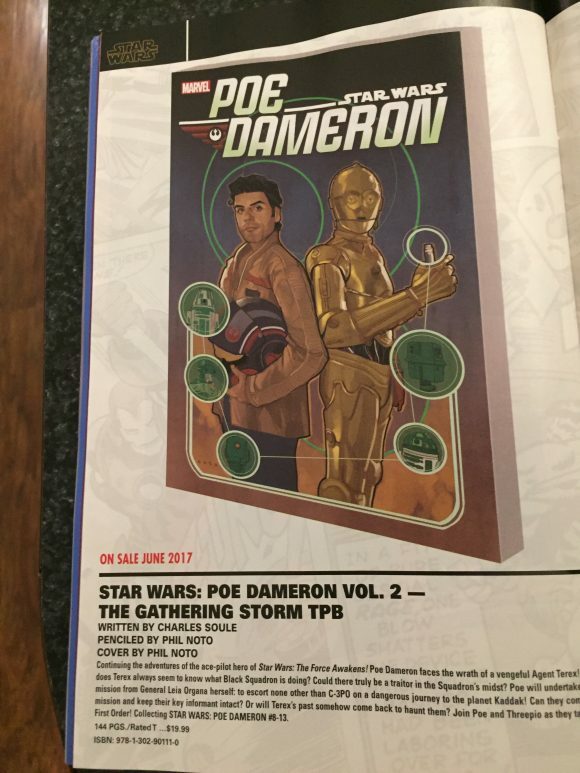 Star Wars: Poe Dameron Vol. 2: The Gathering Storm. Come on. Like there is a Poe Dameron anything and you think I’m not excited for it? Please. But seriously, this is my favorite book out right now and I silently (and sometimes on social media) thank Charles Soule and Phil Noto every day. It collects Poe #8-13 and it will look excellent on my shelf next to the first volume. From Marvel. 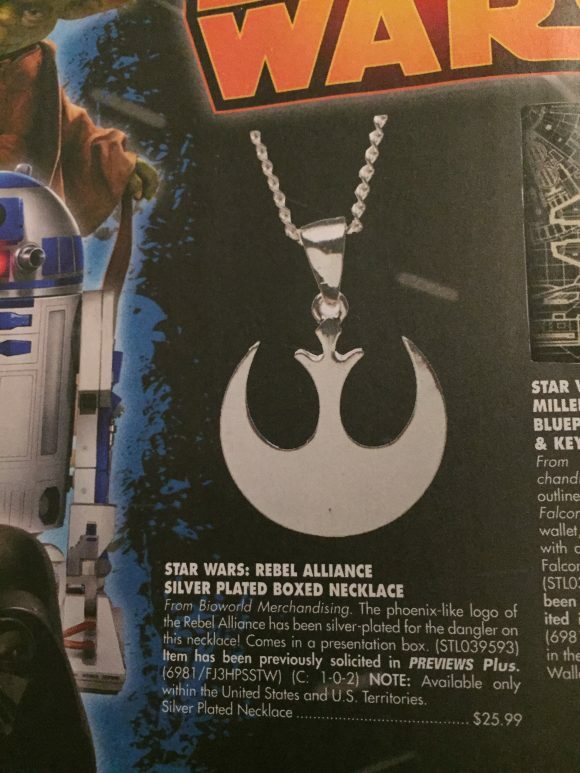 Star Wars: Rebel Alliance silver-plated boxed necklace. While I’m talking about Star Wars, this necklace is beautiful. I bought a similar one at a show a year or so ago but it’s getting worn out. I figure I should get a few of these to have because rebellions will never go out of style. Plus, it matches the tattoo on my calf. From Bioworld Merchandising. 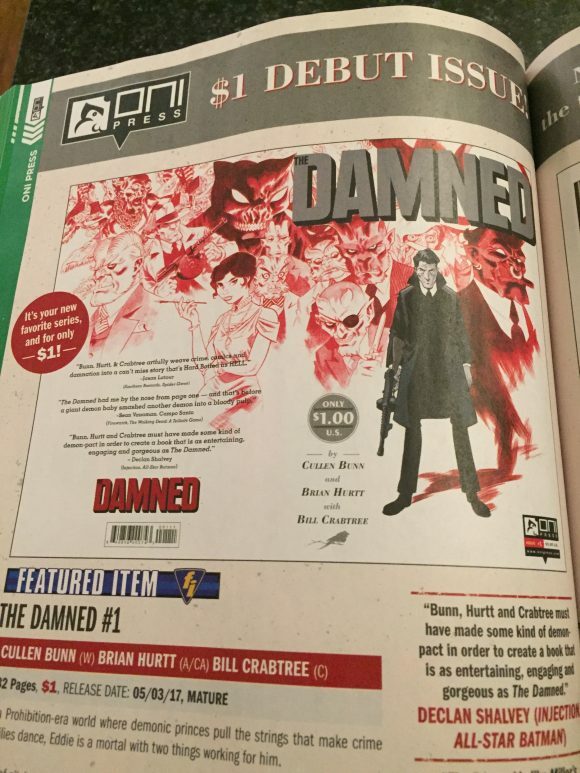 The Damned #1. This book from Oni Press, Cullen Bunn, Brian Hurtt and Bill Crabtree looks super! Plus, it’s only a dollar. A DOLLAR! Prohibition, demonic prince, a guy named Eddie…what more could you ask for?!? Image 25th Anniversary blind box. This is something new that Image is trying. 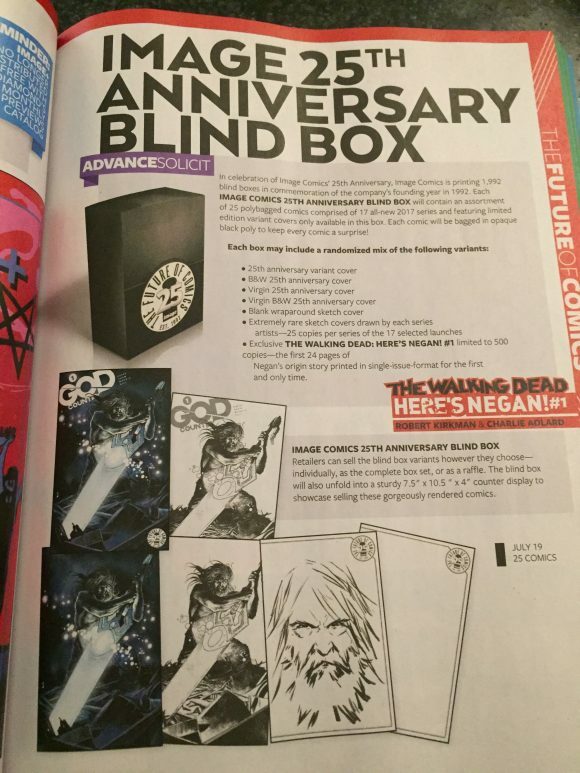 It’s to celebrate their anniversary and you can get all sorts of cool variants including the “Here’s Negan” story. It will be interesting to see how these do from a retailer perspective and from a fan perspective. I’m anxious to see what will be in the box I order! 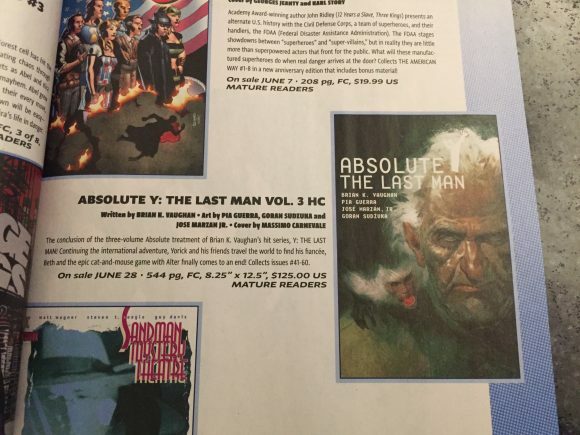 Absolute Y: The Last Man Vol. 3 hardcover. This finishes up this Absolute series. Yes, I have the first two. Yes, I LOVE this series. Yes, this will also look beautiful on my shelf. Evan Dossey knows what I mean. This is a beautiful series to read in this format, or for that matter, any format. 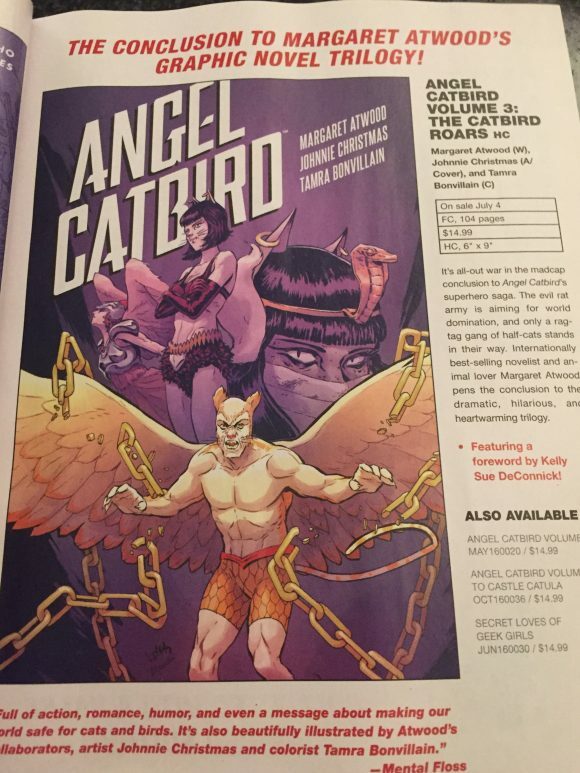 Angel Catbird Vol. 3. Just like Y: The Last Man, this is the last book of this Dark Horse series by Margaret Atwood, Johnnie Christmas and Tamra Bonvillain. And what a ride it’s been! If you like animals or good stories, this is a series for you. I’m totally ready to see how this wraps up!! 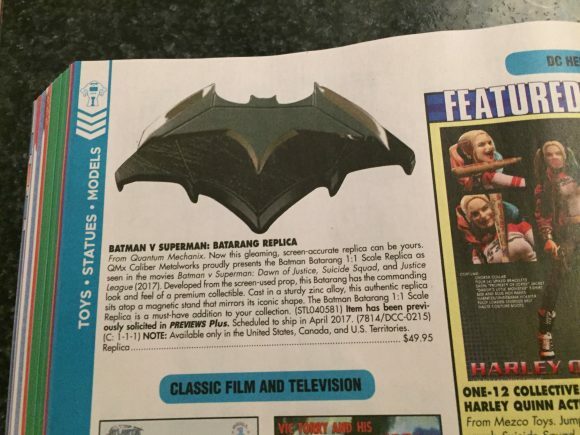 Batman v. Superman Batarang replica. Love or hate the movie, this is an awesome collectible from Quantum Mechanix. Now I just have to have Scott Snyder and James Tynion back to the store so we can throw Batarangs again. One of the best nights ever. 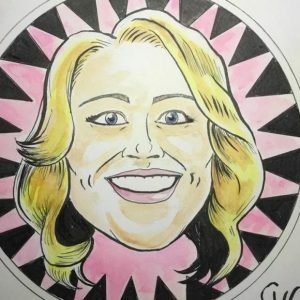 OK, comic peeps! That’s 13 awesome things! 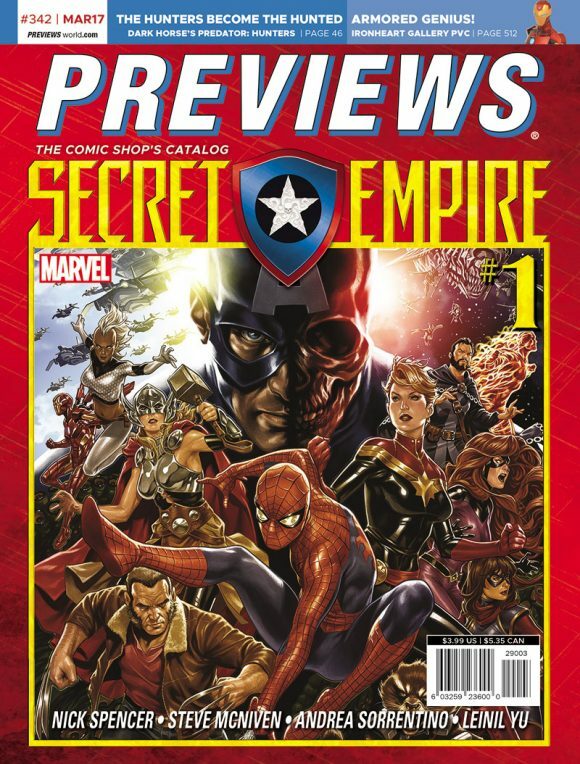 Now, go to your local comic shop and check out the latest issue of Previews for yourself! And remember to place pre-orders because that REALLY helps your stores and creators out. Keep reading comics and be kind to each other! Columnist Christy Blanch writes LAST WEEK’S COMICS TODAY for 13th Dimension. She also operates Aw Yeah Comics in Muncie, Ind.